We will meet next to the playground. Park at the track and the gate will be open for strollers! Keep Up With SLAM'n Columbia! Join SLAM Columbia on Instagram! Contact the SLAM Columbia Team! 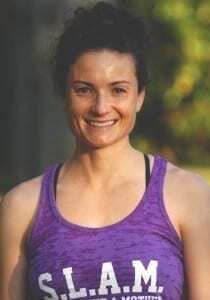 Bridget Hall is a certified ACE Group Fitness Instructor, Bikram teacher and 200 hr Power Vinyasa yoga Instructor and certified in CPR/AED. Bridget is from Durham, NC, but living in Columbia, SC while her husband is stationed at SHAW AFB. Bridget lives with her husband, two sons (Connor, 6 and Logan, 4) and baby girl, Brooklyn (1 year) Bridget is not only passionate about yoga, but running, fitness, and encouraging other mother’s to be the best self they can be! Bridget’s favorite way to SLAM is by running, and of course her yoga practice. Kaileigh is an ACE certified personal trainer and is CPR/ AED certified. She has always had a love for sports and fitness growing up playing soccer and lacrosse. 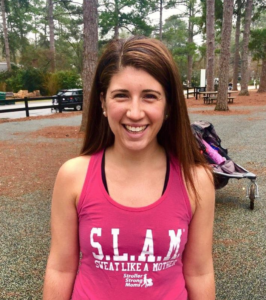 Kaileigh is a military wife, mom, and speech language pathologist. Kaileigh rediscovered her love of running after having her daughter through Stroller Strong Moms. Since her birth she has run 5ks, a 10k and a half marathon. Kaileigh brings enthusiasm to every class and is always looking to sweat! To all the moms out there, you gotta check this out. A kickin’ workout and you don’t need to find a sitter. Bring your babies/kids, your stroller, yoga mat, and a smile. You get to make new friends with like minded moms, sweat together, laugh together and feel amazing and empowered when you’re done!